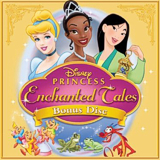 A ton of unsold copies of Enchanted Tales: Follow Your Dreams are repackaged with a redundant new bonus disc bundled in. 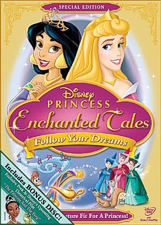 First released back in 2007, Enchanted Tales: Follow Your Dreams was intended to be the first in a line of newly created Disney Princess stories, until new Mouse House honcho John Lasseter put all those direct to video continuations to sleep. Now, following a raft of so-called “re-issues” for various Disney titles (including Pooh’s Heffalump Halloween Movie), Enchanted Tales returns, in the exact same disc – and packaging – as was released in 2007. In the television level, two-story compilation, Aladdin’s Jasmine discovers that good old hard work is what will get a girl ahead in life and, in her first cheaply animated follow-up ever, Aurora from Sleeping Beauty learns to believe in herself. Okay, from that little dry synopsis there you’ve already got my general feeling towards the intention of this Disney spin-off line that promotes their Princesses – basically any of their animated heroines that they can put a royal spin on, hence Pocahontas’ and Mulan’s inclusion in various other merchandise. I am, of course, being way too harsh from the off. Disney is a profit seeking company and, like it or not, it always has been. The difference was that, back in Walt’s day, the money was ploughed back into the company – “What is money good for if you don’t do anything with it” was the Mousetro’s philosophy – while today it’s all about the bottom line, share values and pleasing Wall Street. Into this world came the direct to video sequels, films that, in their right place and when done well, succeeded in their own little way. Walt Disney himself spun characters off into their own worlds. The Mickey Mouse Club leant the classic characters a new lease of life, the Disneyland series a place to see the old movies and even premiere new ones. Jiminy Cricket was used in the I’m No Fool series of educational shorts. Comics were big business in that era, and Lady And The Tramp’s Scamp was a long-running hit on those pages. Walt made compilation features and television programs galore based around old cartoon output combined with new animation. He took Scrooge McDuck – a comics phenomenon – and put him on the screen long before DuckTales came along. Picking up almost 50 years since she last graced screens in Walt’s ambitious, modern-styled Sleeping Beauty, Aurora’s episode Keys To The Kingdom starts things off with the first half of this two-handed compilation. In a story reminiscent of one of the similar episodes in Cinderella II: Electric Bibbidi-Bobbidi-Boo, the little woman is put at the head of the royal household for the day when the men folk go off for “a conference”. What, like the annual “Beating Off Malevolent Fire-Breathing Witch-Dragons Convention” or something? I heard that’s a favorite. Anyway, things soon prove all too much for Aurora, and she turns to Fauna, Flora and Merryweather to help her out. Alas, the three fairies have all left town too (what?) but Merryweather was thoughtful enough to leave Aurora her wand to use in the event of emergency. So that’s fine. Things that turn out too good to be true usually are and of course the Princess finds out that magic isn’t the key and must resort to her own inventiveness to put things right. Picking up who-knows-where in the Aladdin continuum (sounds like a Bourne movie! ), More Than A Peacock Princess finds Jasmine fed up with her royal duties (yep, all those free lunches, glorifying parades and sitting for portraits must really be tiring) and yearning for something “important” to do. Making sure the young audience ladies in waiting have a good career goal illustrated to them, Jasmine’s dad the Sultan suggests working at the local school, presumably so the women of the world grow up longing to become the teachers that learn the boys to go off and fight the wars, corporate or otherwise. Eventually, Jasmine is able to rescue the Sultan’s runaway horse – and thus a strange young Aladdin clone’s job – and gain respect from her students, so that all is good in Disney marketing’s world of balance. What struck me first was how choppy this overall presentation was. We’re not actually given a full “program”, and more of a story selection from the menu, which acts as an introduction in its own right. I suppose that’s an interesting way of using the DVD format and combining it with programmed content, but the effect wasn’t a smooth as it could have been. The stories themselves also didn’t add up: in Aurora’s segment, the fairies were able to travel by flight without the aid of Merryweather’s wand but when they needed to get back it was clear she suddenly needed it. So how did she fly in the first place? And then it took them longer to magic themselves back to the castle than for Hubert to deliver an important speech and for the rest of the royals to travel back in their coach? Why does Jasmine appear to sleep in her day-to-day outfit? In full make-up and accessories, no less! Why does Iago quote A Few Good Men? Why is everything so rushed, undercooked, and confused? Likewise, in the animation designs, the hard, angular style of Sleeping Beauty against the rounded softness of Aladdin, don’t compliment each other very well and clash somewhat. The drawing itself, over both stories, was fairly adequate, but only on the scale of a generously budgeted TV episode rather than approaching the feature quality that the DTVs were striving towards when they were unceremoniously cut off. The flat cartooning, which tries overacting to cover its shortcomings, is credited to Toon City, and while the computer coloring and backgrounds add the pre-requisite sheen, the draughtsmanship is awfully short on draught. Worst seemed to be the close-ups, where the Princesses themselves were most alarmingly off model. But, at least the target audience of young, excited females are being given a dose of new footage here (at least, they were when this was first unleashed in 2007), unlike the TV episode selected Disney Princess titles of yore. We’ve since become used to seeing Jasmine float on and off model in those past outings, and so one might feel that we’ve been given about average TV animation here, but the surprise of seeing Aurora back on the screen in anything less than stunningly clean personality animation is especially jarring. The backgrounds attempt to do an Eyvind Earle but come off as copycats of what we’ve seen before and all-too-clearly bland new images that have simply been spray-painted with grit and dirt to give it the old school look. What doesn’t help is the passing of time, and how Aurora betrays her underwhelming, passive attitude from the 1950s for the now usual, Broadway bound – dare I say it – cool girl in the palace, singing inane carbon copy songs including a title tune that sounds more hoedown than royal. The other voices continue the some good/some bad trends established in previous TV and DTV offerings, with recent Cruella De Vil Susanne Blakeslee doing her best Julie Andrews knock off in the narration and the most authentic being King Hubert’s stand-in, but for someone who once reached operatic heights, Aurora is painfully thin on the high notes. Maybe all that sleep got to her vocal chords…? Right…this disc has been created, marketed and intended directly for little dreamers, and I am probably reading way too much into what is ostensibly a child’s product, but even on its own terms, I just didn’t see it working. It’s not only repetitive (Jasmine’s song may just as well been a rearranged reprise of Aurora’s melody) but there are no elements of danger, hardly any excitement (apart from Jasmine’s horse bolting), with everything wrapped up too cutesy and non-threatening. I’m sure the Mouse has done its market research, but from my experience, the audience they’re going for here like a bit of trouble, they like seeing the Princess’ friends like the Prince, or Aladdin, or the Genie (who all go missing here), and they like being able to see their heroines coming out on top after a pretty rough fight. Let me tell you that there’s a reason Cinderella II is reviled not only by collectors but by the young kids who see it as boring, while the admittedly exciting Cinderella III gets thumbs up and re-runs aplenty. And as if the moral of the story got lost in the substandard, workmanlike storytelling along the way, the Princesses both pop up for a confirmation at the end of their segments, just like those Filmation cartoons used to do on TV. I’d love to be able to get excited by things like this. Mickey Mouse gets re-invented all the time – I wish they’d do more with him – but it just doesn’t work with characters like the Princesses, especially when we’re being asked to believe there is any kind of prestige to the release. Run it on TV – fine – that’s where it belongs, as nothing more than the merchandising commercial or moral teaching child’s tale they’re designed as, but essentially these are the same characters in the same situations doing the same old routines. And doing them badly, as if they’ve either forgotten the moves, or simply going through the motions. Comments like mine above (much of it, I have to say recycled from the original 2007 review) probably didn’t help shift too many copies of Enchanted Tales, going on the evidence here. This is the exact same disc and packaging – right down to Disney’s claiming “2007 DVD Release” on the back – as was put out previously. Supposedly the first in a new line, the Disney Princess animated stories have never been followed up, so what that means for Beauty And The Beast’s Belle and another new tale for Mulan, both promoted in the Sneak Previews, is anyone’s guess! One might have thought that, as a “re-issue”, the Studio would have included these two tales in a new collection, to get them off the shelf more than anything else, if indeed they were ever completed. But nope, all that is offered anew is a Bonus Disc, bundled into the shrink-wrap on the back of the original sleeve. Prising the cardboard cover off the back, the real reason for shoving this back in stores becomes clear: front and center of the new art is Tiana, the heroine of this holiday season’s grand return to hand-drawn feature animation The Princess And The Frog. The disc promises an “exclusive sneak peek”, but all this turns out to be is recycled footage that hungry fans will have seen online and elsewhere. All this material – the scant four and a bit minutes of it anyway – has not only already been shown, but will likely get replayed on TV in the run up to the film’s release, and certainly expanded for its eventual disc release anyway. Having to shell out for Enchanted Tales simply to see what we have mostly all seen is a cheap way of ripping fans off. All else that’s new to the Bonus Disc are a couple of “music videos”, though my feeling is that these are audio track remnants of the other Cinderella and Mulan stories that were in production but will probably now never see the light of day. Going on this evidence, thank goodness, since both are the kind of over frantic, look we’re singing, wishy-washy, drippy songs that gives the modern Disney princess a bad name in song taste. Cinders’ Happiness Was Made To Share is the worst of the two, Mulan’s Working For A Dream is just about bearable, but you can guess their quality simply from those bland titles. The tracks, lasting less than a couple of minutes each, were obviously completed before animation actually began: almost a joke here is that the Cinderella song is laid over footage from her two direct to video sequels, while Mulan’s track plays over material from Mulan II. Are you not really convinced of the luxurious cheapness cobbled together here yet!? As for the original disc, I didn’t and still don’t get the point of the FastPlay feature on this title. Since the menu acts as an introduction to the stories, it seemed to get stuck when it reached those options. The intro is unintentionally amusing in its own right, with Susanne Blakeslee’s “Julie Andrews” trying to make the notion of a storybook castle enticing by repeating the word “castle” in a pawsh accent several times. It’s also the longest menu set up I’ve come across in a long while, running almost a minute before we can select anything from the Sleeping Beauty inspired storybook itself. Belle pops up in another “music video” supplement, though unlike the others this is clearly a then-newly animated clip from the unreleased story that back in 2007 looked like it would debut in a future Disney Princess title, Kingdom Of Kindness, and now looks as if it will join Cinderella and Mulan in the never-completed heap. The (another awful) song, You’ll Never Lose This Love, certainly isn’t anything to write to Broadway about, and the animation might put fans off for good, with pitiable modelling and, even worse, lip-sync that looks like poor Belle is often singing another song! A couple of games are neither that well designed or enjoyable to play. Aurora Dress Up is like the same thing on the Anastasia special edition where the player must dress the Princess appropriately for the ball. Unfortunately, unlike the more fun Anastasia game, this one is limited in its choices and does not allow the choosing of ridiculous items of clothing for Aurora to wear. A jester’s outfit is all there for the trying, but when picked we’re told it’s not suitable for a Princess, and that is that. Spoilsports. Find Sahara (or “Sir Haira” going by Blakeslee’s pawsh Andrews) is better designed, but not much more fun to play. We’re asked to find Jasmine’s steed Sahara by jumping on the Magic Carpet and tracking him down, though once again it’s essentially a pre-determined ride and picking any route alternate to where the game really wants to take you results in a “I don’t think he’s there” retort which only leaves other options limited. The best line, which I found hysterical, was “Those are horse tracks, and Sahara is a horse!” That’ll help, thanks. On the new Bonus Disc, you’d perhaps think Disney would include The Princess And The Frog teaser, or even – whisper it! – the new full trailer, but there’s absolutely nothing in addition…what a waste of a disc! The original 2007 disc naturally runs through older titles, recalling previews for The Jungle Book Platinum Edition, Enchanted, Meet The Robinsons, the first Tinker Bell, Disney Parks, the other never to be Enchanted Tales (with Cinders and Mulan), plus franchise releases in the High School Musical 2, Little Einsteins and My Friends Tigger And Pooh lines. Old or what? Well, at least the package looks good, with nicely modelled heroines gracing the front of the sleeve, though the typically over-the-top fancy-schmancy design exaggerates things to the point of being too much. As in 2007, the white keepcase is accompanied by a gold foiled and embossed slipcover, which only looks more bulky rather than particularly enticing. Inside, it’s same old, same old, with the chapter insert and outdated advertising for Hanna Montana and a Disney World sweepstakes promo that’s now embarrassingly well over. The slipcase also holds the bundled in Bonus Disc, a simple disc-sized cardboard wallet that repeats the Enchanted Tales information on the back, but inserts The Princess And The Frog’s Tiana on the front alongside Cinderella and Mulan. Interestingly, the wallet sleeve promotes this as a “2009 DVD Release”, but this new fluffy promotional disc of less than eight minutes material aside, there’s really nothing worthwhile on offer for those with the 2007 disc. Completed and released in 2007 and running less than an hour, there would be a major outcry if this didn’t look absolutely stunning. It does, and all the better it is to pick out all the inaccuracies in the animation! The bonus disc presents the Princess And The Frog featurette in anamorphic widescreen, but it’s soft and grainy for some reason, and doesn’t add anything to the experience of watching the same promo material on the web. The soundtrack is on par with mid-to-high level television or direct-to-video titles. Voices are to the front, music to the sides, and the occasional sound effect might whizz to the back, but apart from that there’s nothing to get excited about. An entirely sufficient mix that does the job. English, French and Spanish dubs are included, with additional English subtitles for the hard of hearing. Is this a cheap attempt to get fans to pick up unsold copies of a substandard title? Certainly so, since nowhere on the packaging is there any indication of the “exclusive peek” runtime. Might you be expecting a half-hour look at the production? Possibly some honestly never before seen footage? Well you won’t get any of that here, as it’s just a rip off to get obsessives to totally buy what they already have and have seen all over again. There isn’t even any new packaging on the original disc, for goodness sake…it’s the exact same disc, with the same crummy stories. Parents should especially be aware here not to spend $30 (a couple of dollars more than the original release!) for just over 50 minutes of animation and a bonus disc whose major point of interest can be seen online for free. I thought Disney had turned a corner in getting away from this low-level quality, but this is just poor, poor, poor.